Our expert workforce assist us in providing installation services for Optic Fibre Systems & Networking Systems (Both Indoor & Outdoor works). We specialize in Splicing of Optic Fibre Cables (Single-Mode & Multi-Mode - 2 to 96 Fibers). and OTDR checking and reports. Our field engineers will also recommend and plan your network, give the list of equipments to be used/required and quote an approximate figure for the set-up including Installation and Commissioning cost and time frame for completion of work. We utilize the best Machines, Tools and Test Instruments to give you trouble-free working of system/network and also assure you of zero defect and complaints in splicing of fibre. We have implemented several Large and Small projects of the likes of MSO's, Government Agencies, IT/Telecom Companies, Railway Institutions etc to their utmost satisfaction. We have been serving now for over a decade. 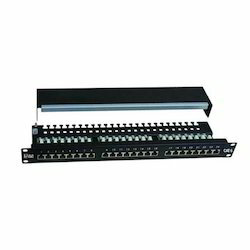 Bestnet Category 6 Shielded Panel is available in a 24-port version and provides the ability to terminate fully shielded Category 6 cable. Panels are designed to exceed TIA/EIA-568-B.2-1 component level specifications for superior performance. The panel features front labeling areas and comes with a rear cable management bar that mounts easily to the back of the panel. Uses Snap-Type frames, eliminating screws on front side of the panel. Colour frame to avoid confusion each time user need to re-assign user network wiring. PCB Based Module and port identification and circuit identification on the rear.